Sourav Saha ● Kolkata: When the whole city is busy preparing for the Durga puja a handful of students of the Vidyasagar College of Kolkata have began their puja festivities on a different note on 15 October afternoon. They staged a drama, ‘Golper Seshangsho Theke' (from the last part of the story), on the day to welcome the new students of the institution. Short plays have become an integral feature of the College’s programme schedule thanks to some of the teachers who inspired and encouraged the students of this institution to continue their dramatic heritage. The plot of the play, written and directed by Piyal Bhattacharya, a faculty of this century-old institution, has moved around the emotions of life. It’s a combination of three inter-linked stories of Tithi (Shini Mitra), Anindya (Prabhas Mondal), Barnali (Saheli Ghosh), Rupa (Anjura Khatun), Papri alias Bhutu (Sayani Roychowdhury) and Sunil (Mithun Gupta) and Anindya’s elder brother and brother’s wife (Subhadip Saha and Kalpana Das respectively) etc. Protagonists brilliantly turned into story-tellers in the play on several occasions. The transformation was smooth and complemented the sub-plots of the drama appropriately. The play has narrated the eternal crisis of love and life and the thirst for reaching a meaningful destination with or without the loved ones. The intricate story-line has been properly portrayed by the director and backed well by the actors on stage. In fact, acting of students, many of whom were perhaps appearing on the stage for the first time in their life, was quite impressive and surprisingly has a professional touch. It was not at all amateurish. Shini Mitra has given a blazing performance as Tithi. Others were also good. Use of poems by Rabindranath Tagore, Jibanananda Das, Shakti Chattopadhyay, Gulzar, Joy Goswami, Mallika Sengupta and Srijato has lifted the quality of narration to a different level all together. 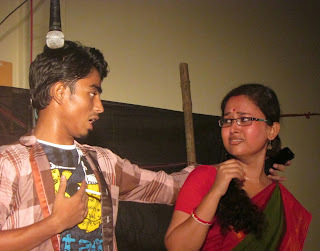 Once no Bengali festival was considered complete without plays. Nowadays staging drama has become somewhat limited to group theatre only. At this hour of decaying culture enthusiasm for stage shown by these students of the Vidyasagar College is extremely encouraging. The city’s culture needs more such enthusiast youth to step ahead for a start afresh.